The orarion (orar in the Slavic traditions) is the distinguishing vestment of the deacon. It is a narrow stole, usually four to five inches wide and about ten feet long, made of brocade with seven crosses embroidered or appliquéd along its length, or sometimes embroidered with the words "Holy Holy Holy." The deacon wears the orarion over his left shoulder with the front portion draped over his left forearm. He will often take this section in his right hand when leading litanies or drawing attention to a particular liturgical action. In the Greek traditions, the orarion is longer, and besides hanging down from the front and back, it is wrapped once diagonally under the right arm and over the left shoulder. 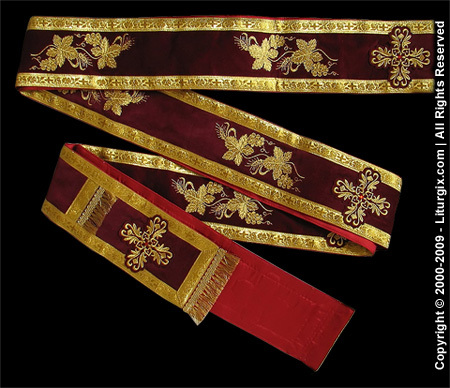 In Russian practice, this "double orarion" is an award given to deacons for length of service or other distinction. Protodeacons and archdeacons also wear the longer orarion. When preparing for Communion, the deacon will tie the orarion around his waist, bringing the ends up over his shoulders (forming an X-shaped cross in back) and then down in front, tucking them under the section around the waist. The subdeacon also wears the orarion, but always wrapped around his body in the manner described above. In some traditions, acolytes may sometimes be blessed to wear the orarion, though in a manner similar to that of a subdeacon and usually with both ends hanging straight down in front, rather than crossed in the X-shape. This page was last edited on April 29, 2011, at 17:22.